What do we mean “fifth wall”? Well, many times the flooring for a project is one of the last materials to be selected. Almost as if it is the last layer of a project to be considered. But how do we build a home? From the ground up of course! Floor covering for your project just happens to be the overall canvas that everything else sits upon. 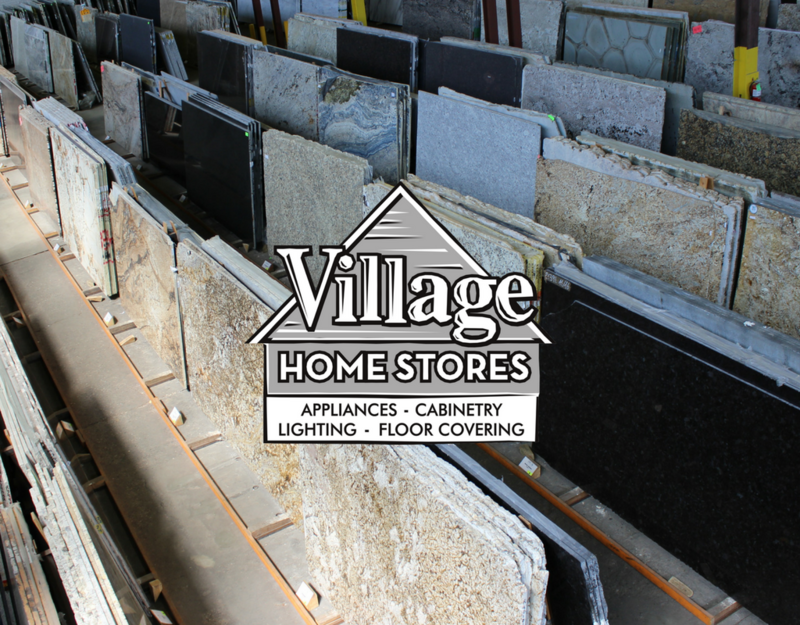 This is why Village Home Stores has recently expanded to now make room for a full showroom and added staff to help you select the perfect material for your project. Selecting the right material for the floor in your home can help an entire project come together. 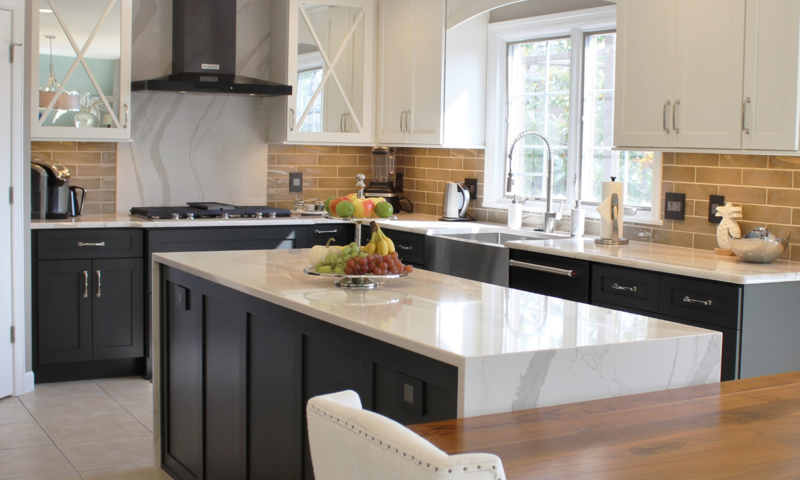 Think of how much time and consideration goes into selecting your new kitchen countertops… a lot right? The flooring in a kitchen will cover much more surface overall than those counters. In most cases, flooring makes up anywhere from 25% -40% of a surface in your kitchen. If you consider a kitchen as part of a “Great Room” then that selection just got even more important. Village Home Stores doesn’t want to put a lot of stress on you to make that selection. We are here to help you with your project from start to finish and that includes selection. Our expert sales staff can help you choose what is most practical for your space as well as what will give you the best overall look. Having samples right here in our showroom has already been so helpful in these first few months of adding our Floor Covering Department. The entire selection process can now be done here in our store, alongside your design and sales team working with you on your project. Your entire project just got easier. The opportunity to cover this large plane of surface opens up a lot of possibilities when you are building an entire design with your team here at Village. Engineered and solid hardwoods in a number of finishes, sizes, textures, and styles. With many brands like Somerset, Mullican, Mannington, Bella Cera, Hallmark, Lockwood, Valuemark Hardwoods, Armstrong you are certain to find the right one for your space. Luxury Vinyl Tiles are a highly durable surface that can mimic the look of wood or ceramic but with a softer and warmer material. An acrylic-based grout can even be installed to create a true “tiled” appearance. That same grout is non-porous, and very stain resistant (no sealing of the grout) Brands like Metroflor, Armstrong, Mannington, and Tarkett represent the fastest growing segment of the flooring industry. Vinyl Sheet materials from Armstrong including our thickest vinyl sheet available, Cushionstep. Cushionstep is available in many designs and colors. It feels… well, “cushy” when walked on. A very comfortable flooring choice at a great value. Ceramic Tile by Mannington, Paramount Ceramics, Interceramic, Daltile, and Jeffrey Court is available is a very wide variety of styles, colors and textures. Not just found in square shapes anymore, large tiles and plank-shaped styles have quickly become the more popular choices. Floors are not the only surface you can tile. Tile in the backsplash of a kitchen or installed in bathroom showers can make a huge impact in a design. Let our staff help you select the tile and pattern for installation. Carpeting from Dream Weaver, Southwind, Dixie Home, Phenix are available in so many styles and colors the possibilities are endless. Sculptured styles are quickly becoming a popular choice. Dixie Home uses what is called a “tip-shear” effect which uses a combination of loop and cut pile together like shown in the image above showcasing “depth”. Our staff is knowledgeable on the installation processes of every product we sell. Any questions you may have about what materials will be needed or installation layouts or designs can be answered here in the showroom or at your home at the time of measure. Call or click today with any questions you may have. We look forward to helping your space look great from the floor up. Colona, IL- After The Fire. Last week we shared with you the Before & After photos from this Colona, IL home damaged by fire and smoke. We wanted to show you around the kitchen in a little bit more detail. To say this kitchen has some angles is an understatement. This birds-eye view color rendering shows the overall space better than we could capture in one photo. 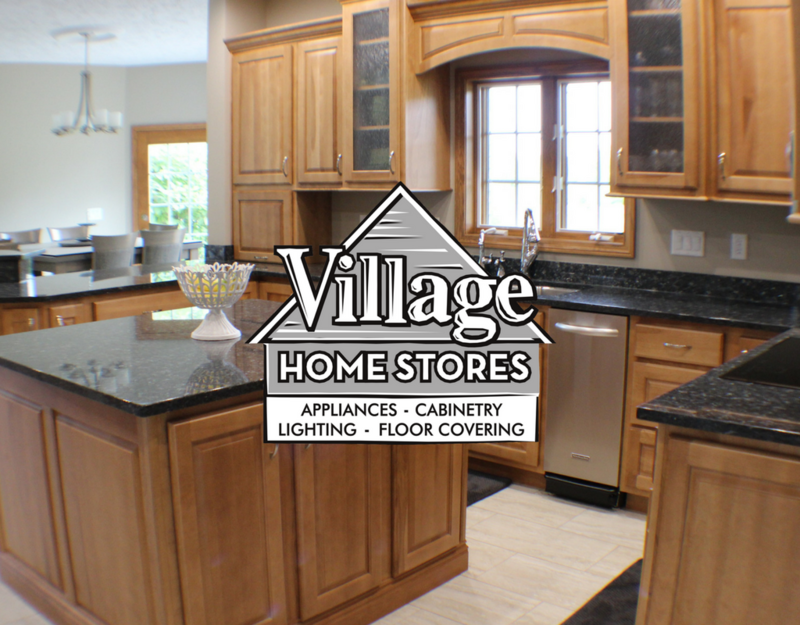 This rendering is an example of what you can see during the design phase here at Village Home Stores. These cabinets hug every corner and even access spaces that may have otherwise been wasted areas. Let’s start with the wall to the right of the built-in pantry. That clipped corner does actually have usable shelves within. It should be mentioned that this cabinet SKU is a standard cabinet. Many times our designers can use the most of your space with the right design! Immediately behind this angled cabinet is another great standard SKU that can add a lot of interest to a space. While the shelves may not hold a small appliance, am outside corner cabinet can be a great way to turn a corner. Angles are also integrated into the ends of the exposed walls of cabinetry. If you revisit the rendering above you will see that entire pantry wall has angled end cabinets that clip the edges and allow for interest and an easier access into the room. The end of the cooktop wall of cabinets has not been clipped to allow for a full depth of preparation space on both sides of the KitchenAid Induction unit. Induction is a fantastic feature and we can’t wait to show you more on it soon. Another convenience for the cooktop user is a pull-out trash cabinet directly to the right. Below the cooktop is a large double drawer base which makes for quick and easy access to pots and pans without having to open doors to access a slide-out shelf. In addition to the pull-out trash, a KitchenAid trash compactor is located near the kitchen sink. This 15″ wide unit is Whisper Quiet® Plus Sound Insulated and has a 5:1 compaction ratio reducing trash by up to 80%! The section of island cabinetry that faces the great room has an easily accessed under-counter beverage cooler. Keeping the main refrigerator space clear of cans and bottles this glass-front cooler can easily found by guests and homeowners. The granite in this kitchen sparkles so well and may read like a dark black on camera. It is in fact a deep rich blue granite called “Blue Pearl”. The cabinetry is by Koch Cabinets in the “Seneca” doorstyl, Maple Autumn stain. The San Michelle: “Crema Vein” flooring in the kitchen continues from the front door through the dining room then into the kitchen. We mentioned in our previous post about how kind and amazing these homeowners were throughout a very stressful period and circumstances. Their positive attitudes among loss were inspiring. We thank them again for letting us share their beautiful home with you. If you have any questions about what you see here or our entire process please don’t hesitate to call 309 944 1344 or click to ask. See the entire album of photos from this restoration project over on our Houzz page. We want your building or remodel project to be such a positive experience you can’t help but tell everyone that you know how easy the whole process was. How can we make sure this is the end result? 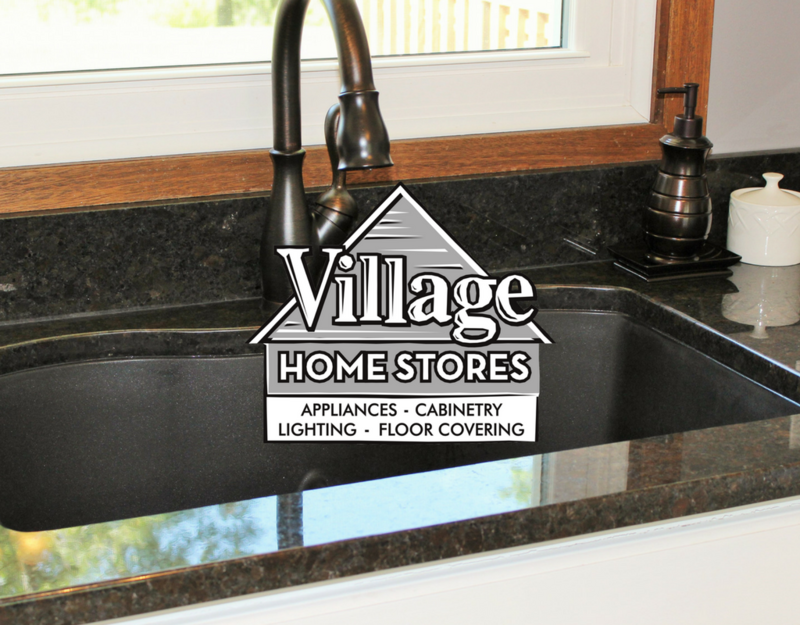 At Village Home Stores we believe that main ingredient to a successful project comes from communication. That communication begins in the early stages of the planning phases and continues until you are enjoying your morning coffee in your new space. Selecting and confirming materials and product details is key to avoid delaying a project down the line. Confirming a countertop material for instance, is only part of that process. What edge profile will be on that countertop and are there finish options? Will your countertops be heavy enough that an overhang will require a support bracket? What about sink and faucet information? Answering these questions early on allows no surprises or unexpected material costs to be added on later once the project has started. Built-in appliances can sometimes come with many additional costs to be considered. Decorative hardware is required for built-in appliances and should be larger in scale and suit the weight and specifications of the appliance. An allowance for cabinet decorative hardware is included in your project estimate. This is allowance is figured per door/drawer and based on $3 each. Custom panels will also be required and can come with a significant price tag. Communicate with your designer early on when you are considering or have selected a panel-ready appliance. This way these added costs can be included with your cabinet totals the entire estimating process. Download the following pdf checklists that pertain to your project or ask your designer for a copy in your initial in-store meeting. Access to the jobsite is very important to keep your project on schedule and going smoothly. Discuss with our Project Manager or your Designer how crews will be able to get into your home. Lockboxes are available if you are unable to be present during all scheduled parts of your process. Dialog about pets and after-school schedules of children may also be needed to assure your entire family has a positive experience. 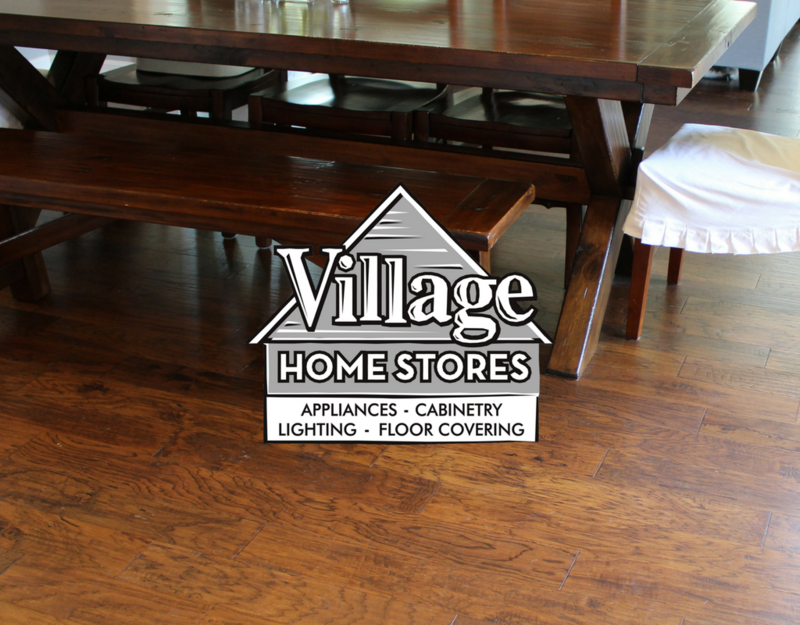 Village Home Stores expects all employees and subcontractors to treat a home as it were their very own. Access to a working power source, parking for crews and delivery vehicles, and a usable workspace in garage or designated area should also be discussed. Nobody wants things piling up in their home. Discuss where materials will be disposed of as well. This varies depending on size and scale of your project. Access to information is important as well. If your project is not part of our Project Management program you may want to create a jobsite binder of your own. Schedules, an up-to-date layout, design drawings, appliance specs and all other details can be kept here and should be easy for all crews to access. The same can be said about finishing materials and supplies. Access is needed to these as well. A painter may be scheduled for your project but if they arrive and there is no paint for them at the job site, it may delay the schedule and push your finished date forward. Products and items purchased from Village Home Stores will be delivered and distributed via our project manager or your salesperson. If you purchase items for your project outside of our store you will need to make sure they make it to the job site. Review your Selection Checklist and make sure all items you are providing are ready and available. If all of your bases have been covered during the beginning stages of planning and purchasing, a schedule for your project should move along seamlessly. As anyone knows, there are always uncontrollable issues that can arise to delay a project. Planning ahead helps you avoid any issue with all of the controllable factors. Actively participating in this planning process will make your overall experience as pleasant as possible. But What If I’m Doing The Work Myself? Hold on to any hardware (i.e. grates and covers) you remove during demo until the project is complete. Especially in old homes, some things you plan on running to the hardware store to replace may in fact be unavailable or more expensive than expected. Many times baseboard from the space gets removed and disposed of by accident or perhaps a piece gets damaged during demo. A great place to find trim within your own house that you can be assured matches in profile and stain is the interior of a closet. Ask any questions about your plan before beginning. If you do not understand a part of your working drawings or if you need help making sense of any of the product when it arrives, call your designer. When it comes time for one of our crews to work at your job you need to have it ready. Plumbing should be cut back and capped for cabinet install. You want the smallest opening cut out in your new sink base cabinet so have all shut offs and anything widening the space removed for installation. We are enthusiastic about projects going as smoothly as possible. We do this every day but we understand it is not something you go through often. Our goal at the end of each day is to make your dream space a reality. Doing quality work right the first time around requires skilled craftsmen and planning ahead. Give us a call today to get started!